miFrame from Striped Sail is an exquisite tablet stand case designed to fit the iPad 2 and the new iPad. Crafted from 24k gold with platinum accents and base, the case is one of the most expensive stands on the market. Despite its precious material, the case delivers the functionality it was meant to provide. The new iPad case looks like a photo frame, but comes with a hidden iPad dock, which allows continues charging via built-in 5-foot USB cable. The new tablet charging station offers viewing angles in both portrait and landscape orientations thanks to free rotation between the positions. All ports and buttons are freely accessible with the device inside the Striped Sail miFrame. 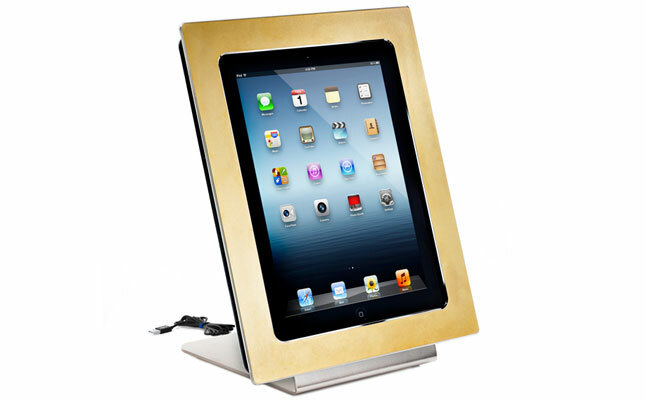 Surprisingly enough, the Apple iPad 2 case can also function as a standard picture frame, protecting any 8x10 photo from dust and UV rays with its unique acrylic coating. The case is also available in many other, less expensive materials. The price for this item is $730.